Like everyone with a phone, I love taking videos -- but I hate that they take up so much space on my phone! And I hate that I have to switch between camera and video, because it takes a while and I inevitably end up missing the first few seconds of whatever it is I want to record. Logitech has a solution for iPhone users who want to quickly capture and share videos without a lot of fuss and a lot of phone space. 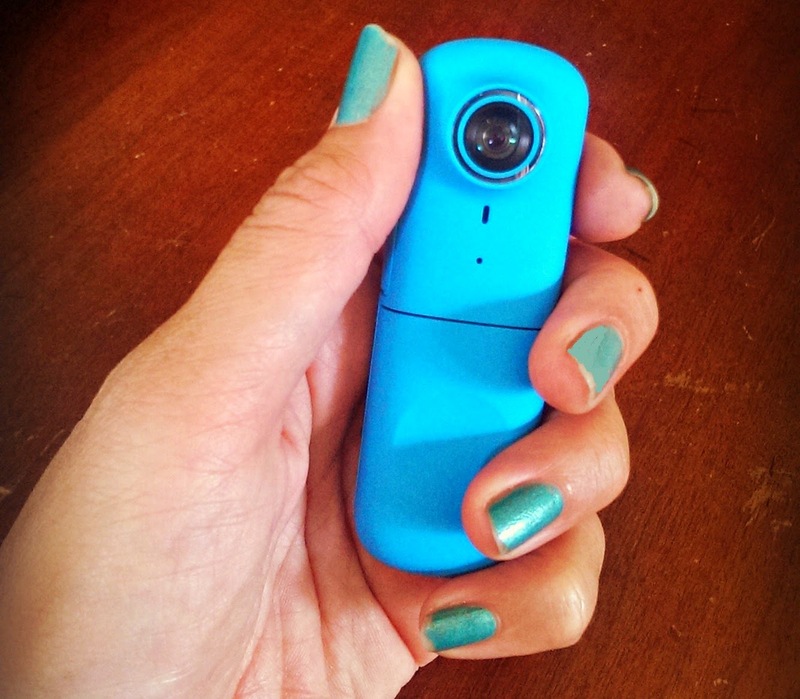 The Bemo social video camera lets users capture moments quickly. It features one touch recording, and a high quality camera with an 8 megapixel lens and 720p HD video recording. 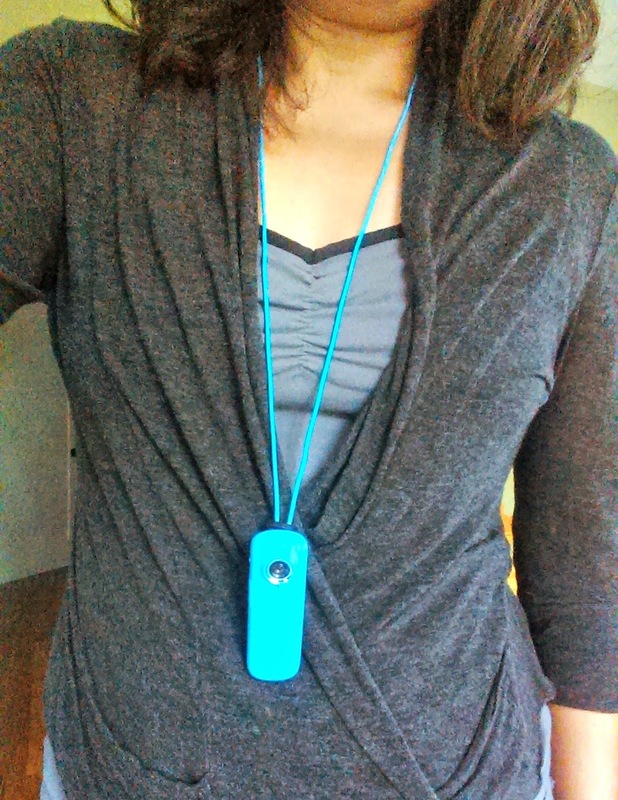 Logitech sent me a Bemo to review -- check it out, and enter to win one of your own! 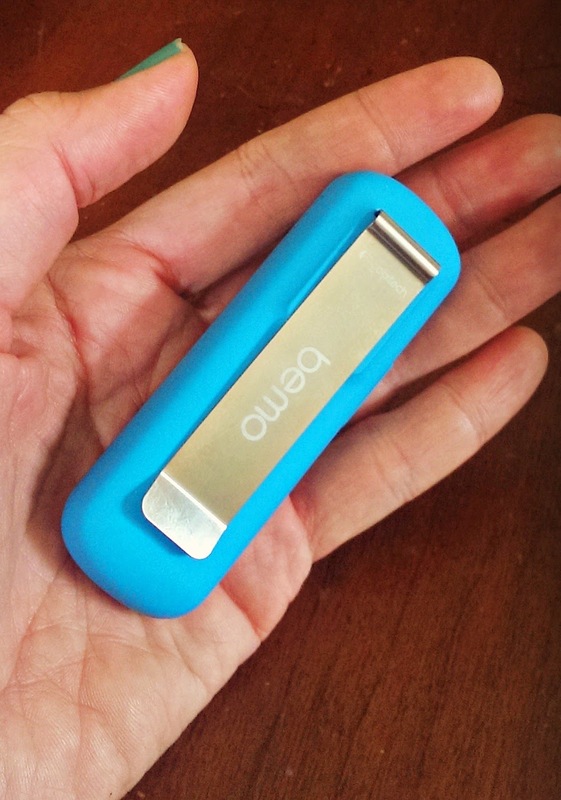 The Bemo is small and lightweight. It easily fits in the palm of your hand. It's super simple -- just press the button to record, and let the button go when you're done recording. You can control the Bemo's recording function with your iPhone (there's a downloadable app), so your iPhone can act like a remote video control. That means you can easily take a selfie video featuring not just your face, but your whole body! 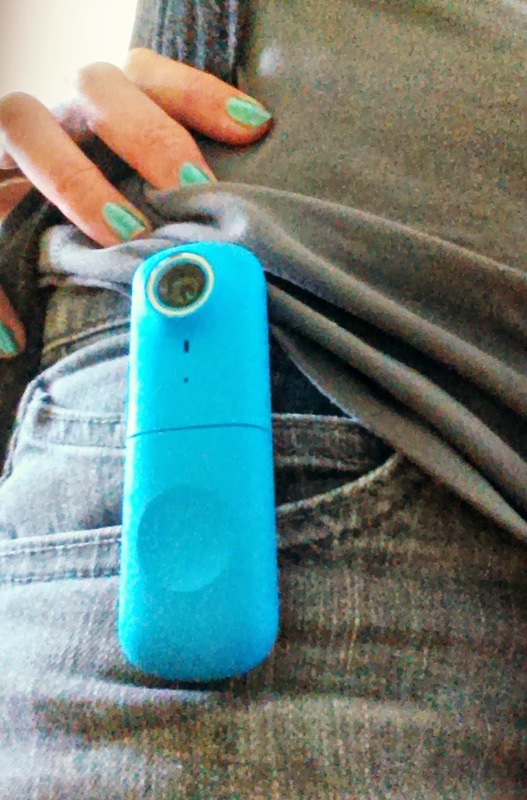 It has a clip in the back so you can attach it to your shirt or handbag or jeans or bike handlebars or helmet or your dog's collar or whatever. You can film yourself riding a bike or a roller coaster or skateboard without having to look into the viewfinder! It also comes with a neck strap so you can keep it close by and get ready to film in seconds. 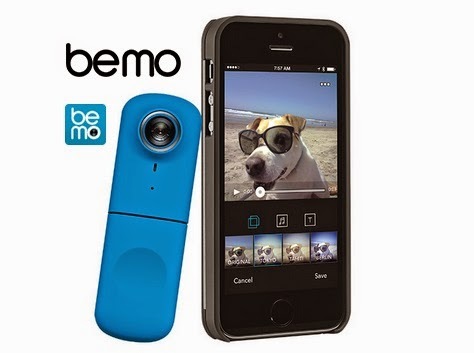 You download the Bemo app onto your iPhone, and your video clips on your Bemo will upload to your iPhone via Bluetooth. You can make basic edits to your clips: add a caption, filters, background music. You can also string a series of clips together. You can share your clips to your social media channels or save and email an MP4 file to your Windows-based friends. 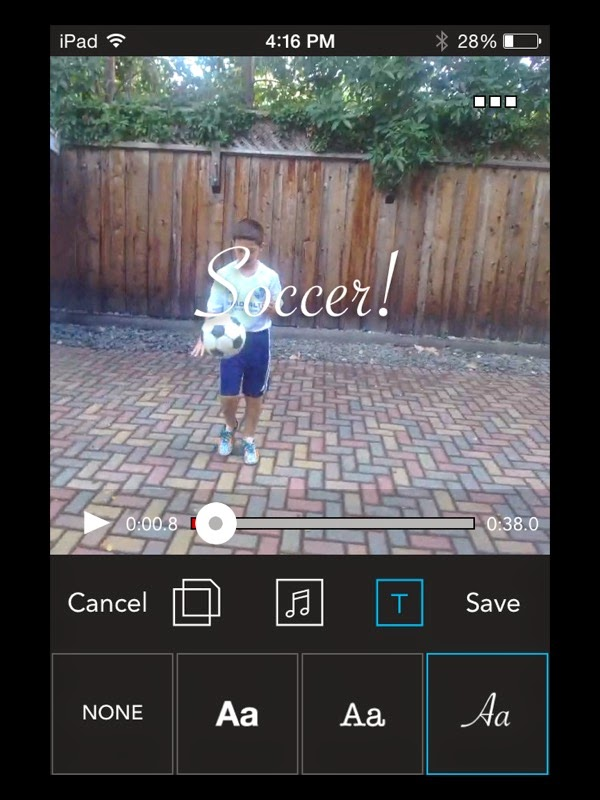 Check out the Bemo video I made of Jammy kicking his soccer ball around! This camera only works with iOS devices. It doesn't work with Android phones. It doesn't have a capture screen or even a viewfinder, so if you want to see exactly what you're filming, you have to juggle 2 devices: the Bemo and your phone. I would prefer a toggle button (press to turn on recording, press again to turn off recording) instead of the press-and-hold button. The editing capabilities of the Bemo app are very basic; you only have limited background music options, and you can't insert text into the middle of your video. The Bemo has a very specific purpose, and for that it is great. 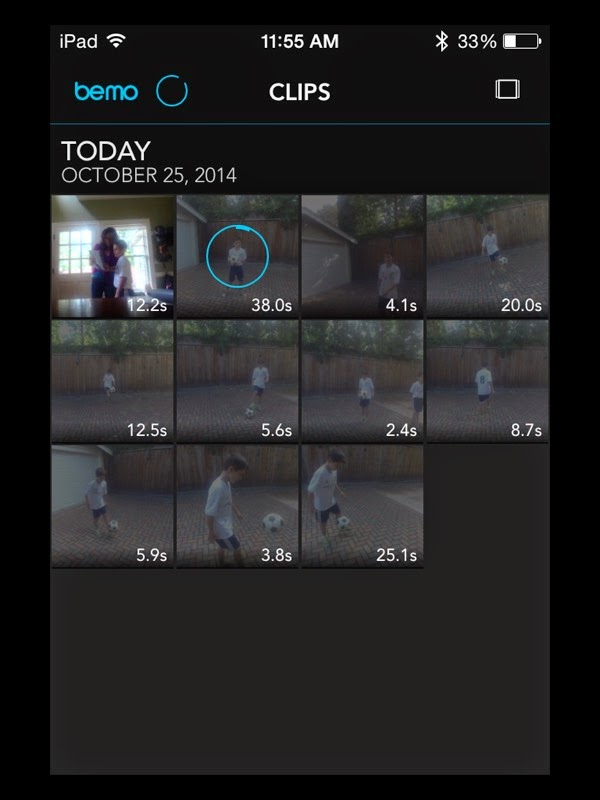 One lucky Bonggamom Finds reader will receive a Logitech Bemo social video camera! Leave a comment on this post and tell me your favorite feature of the Bemo. This giveaway ends at 11:59 PST on November 20, 2014. I will draw a winner at random on Nov 21 and post their name after they confirm acceptance. Continental US residents only. For additional giveaway rules, click here. Come into the Microsoft Retail Store and start getting fit before the holidays! On Thursday, October 30th, Microsoft Store is hosting a fun #FitnessDay event before the biggest candy eating holiday of the year! Microsoft wants to help you get a head start on your health and fitness goals by staying active & fit through a yoga or Zumba class, or just have fun trying out the fitness games on Xbox Kinect! Enjoy a fun, high energy workout and a chance to win great prizes throughout the day! Fitness classes (Zumba & yoga) will be held from 12 p.m. to 6 p.m.
Go to http://on.fb.me/1FWCdGd to RSVP and to learn more about prizing and store locations. The first 150 consumers choose a giveaway (hat, water bottle, yoga mat, gym bag, or jump rope) while they are in-store. Other prizes may be announced during event! Log in and RSVP on this event page to let us know you're attending! 10am – 6pm: In-store giveaways to first 150 consumers. 1pm - 5pm: In-Store Workout activities continue in Xbox Fitness Area. Optional fitness tests available for consumers. Xbox Fitness workout options to include Tracy Anderson, Gillian Michaels, P90X, and Insanity. Trainers in-store to help consumers with all workouts. I'll be attending the Santa Clara #FitnessDay event, see you there!! Disclosure: This is a sponsored post. Event information provided by Microsoft. The views and opinions expressed here are my own. Help all kids reach their full potential with Reading BrightStart! I love to read, and when Alfie and I decided to have kids, I knew that reading would play a big part in our family's life. We began reading to our kids when they were very young, before they even knew what they were looking at. We got them into the habit of sitting and listening and looking. 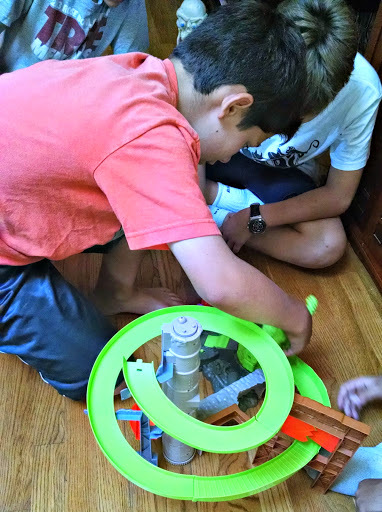 It took longer for the boys to get into it, but we kept trying, and once we found the kinds of books they loved (any book with pictures of wheels! ), they fell in love and never looked back. We read to them every day. Bedtime stories with daddy was a nightly ritual that lasted long after all three of them learned how to read independently. 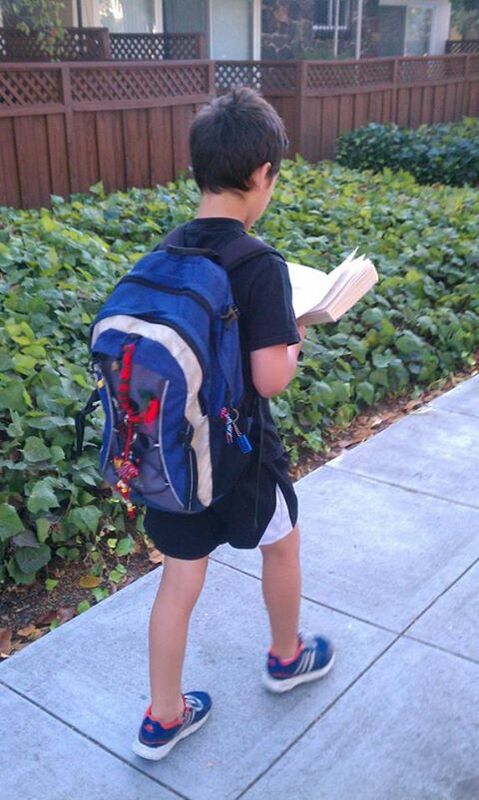 I'm thrilled that all three of my kids love to read -- some more than others, but all three of them know the joy of getting lost (literally lost... they will read while walking to school!) in a good book. But reading is so much more than just enjoying a good story. Did you know that literacy is the single, strongest predictor of adult health? today's information-based world increasingly requires not just a high school diploma, but also some type of post-secondary education -- a 2 or 4-year degree, apprentice training, etc... Good reading skills are crucial to getting an education that will help individuals succeed in life. The road to success begins long before a student enters college, or even high school. A child's reading level by the end of third grade is a strong predictor of how they are likely to do in the future. Struggling readers in third grade are unlikely to ever catch up, and they are at high risk for dropping out of high school. It's clear that early literacy is key. 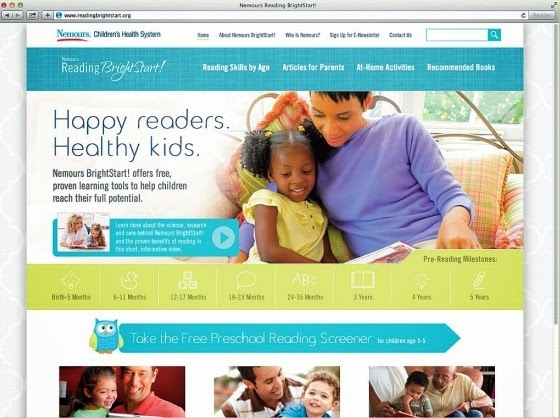 Thirty percent of children enter kindergarten without the pre-reading skills necessary to succeed in school, so That's why Nemours Children's Health System, a leading, has launched Reading BrightStart!, a national effort aimed at improving early literacy. The website offers parents and caregivers evidence-based tools to help their children from birth to age 5 develop the language skills necessary to read. Parents can go to the website for book recommendations, at-home activity suggestions, informational articles, and milestone assessments for every age and stage. All parents want to help their kids, but some parents may not know where to start. Reading BrightStart gives them that starting point. At a recent blogger webinar, Dr. Laura Bailet, Operations VP of Nemours BrightStart, reported that on average, children who have received BrightStart! instruction have shown gains of 114% in their reading readiness skills! Disclosure: I received a gift card and gift bag as a thank you for posting. The views and opinions expressed here are my own. Would you rather be blind from birth, or become blind in an accident? That's a questions I've asked myself and my friends ever since I was a little girl. The thought of never knowing what seeing is like was terrifying, but not so terrifying as the thought of losing my sight after having it. I always chose the "blind from birth" option. Last Friday a movie opened in theaters that resurrected that old childhood fear -- and it tells the story of a person who faced that exact same fear, and faced it with so much more courage than I would have! 23 Blast is based on the amazingly true story of Travis Freeman, who was a typical teenager growing up in a small town in Kentucky. Travis is a local hero on and off the field. In the fall of 1997, in the prime of his youth, he is unexpectedly stricken with an infection that destroys his optic nerve. He becomes blind overnight. Under the influence of parents who love him, a physical therapist who challenges him, a coach who inspires him, and a best friend who he cannot bear to leave behind, Travis shows us what true bravery is by competing on the gridiron, helping his team advance to the State playoffs. The story of Travis and Jerry Baker, his closest friend, from the time they meet on the football field as kids through high school, is sure to leave audiences in awe -- the guy actually PLAYED on the team! -- and in tears. I can't wait to see it. Great news for those starting to plan for their family holiday cards (and that really ought to be you, the holidays will be here before you know it)! Night Owl Paper Goods is offering 20% off your entire order, and free shipping with orders over $49, with code SHINE2014, until October 31. 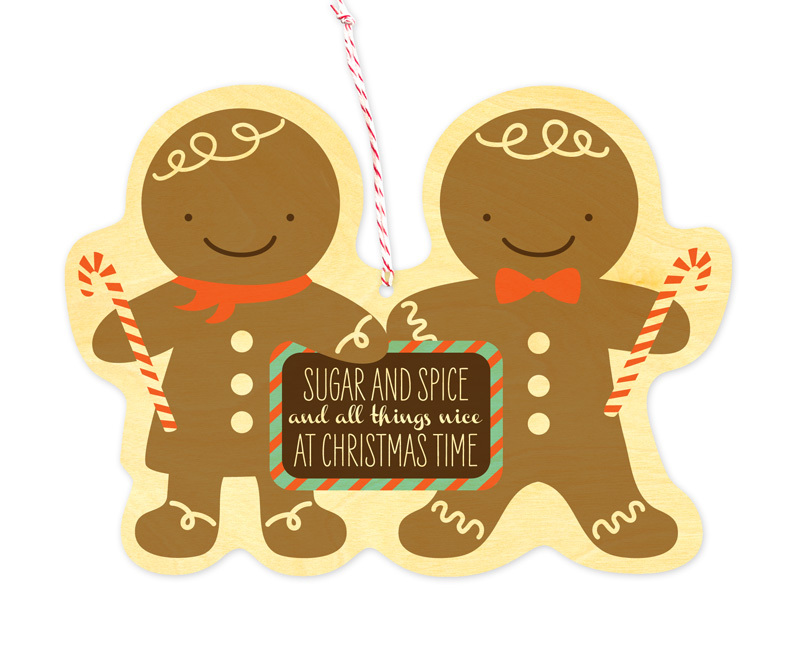 You can order personalized holiday cards made with their signature wood, or in cardstock. Each card features Night Owl's distinctive whimsical design that is sure to be a hit with family and friends. And with Night Owl Paper Goods' beautiful designs plus the 20% discount, you are sure to be HAPPY HAPPY HAPPY! Today I have even better news to share: I'm giving away a Night Owl Paper Goods gift certificate worth $25 to one lucky Bonggamom Finds reader! Head over the Night Owl Paper Goods' holiday card collection, choose your favorite design, then leave a comment on this post with the link to your favorite design. 7) Leave a link on my first Night Owl Paper Goods holiday post (1 entry). 8) Follow Night Owl Paper Goods (@nightowlpaper) on Twitter (1 entry). 9) Like Night Owl Paper Goods on Facebook (1 entry). This giveaway ends at 11:59 PST on November 15, 2014. I will draw a winner at random on November 16 and post their name after they confirm acceptance. Continental US residents only. For additional giveaway rules, click here. I've blogged about Night Owl Paper Goods before; out of all the online stationery stores, they are quite unique in that their medium of choice is wood, not paper. I'm not talking about chunky tablets; their personalized cards and journals and other stationery products are made of the thinnest sheets of wood, giving them the thickness and weight of stiff cardboard, but with a texture and feel that is beyond compare. Their designs are as unique as their medium: whimsical, rustic, modern, and folksy all at the same time. Naturally, this kind of quality does not come at a bargain basement price; you get what you pay for. But I have two pieces of good news for those wondering whether they can afford Night Owl Paper Goods' adorable cards this holiday season: first, their holiday designs are also available in cardstock! That's right, you get to choose between wooden cards and paper cards (which are less expensive and quite reasonably priced). 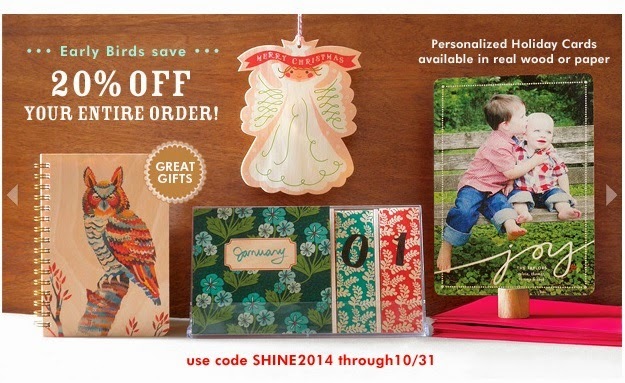 Second,they are having a fantastic Early Bird Special: use code SHINE2014 and get 20% off all Personalized Holiday Cards PLUS free domestic shipping on all orders $49+ until October 31! Choose from 200 modern-yet-folksy designs, custom-printed on sustainably-harvested birch wood. All designs also available on budget-friendly FSC certified paper. Quick and easy personalization! Simply add your own greeting, photo, photos or logo and let our professional graphic designers do the rest. Envelopes contain 30-100% recycled post-consumer waste. All Night Owl Paper Goods products are handmade in the USA. It's a card.... it's an ornament.... it's a keepsake.... it's a one-of-a-kind! ... and you can personalize the back of the card with a message, your choice of patterns, a photo, or a 2015 calendar! Disclosure: I am receiving a gift card as compensation for this post. The views and opinions expressed here are my own. Soccer is a contact sport. It's fast and hard, and the action never stops. It's no wonder we see soccer injuries at almost every game! On TV, I've seen horrific injuries: torn hamstrings, twisted ankles, concussions, broken limbs. I've seen a guy knocked unconscious in mid air and another guy's leg snap in two. 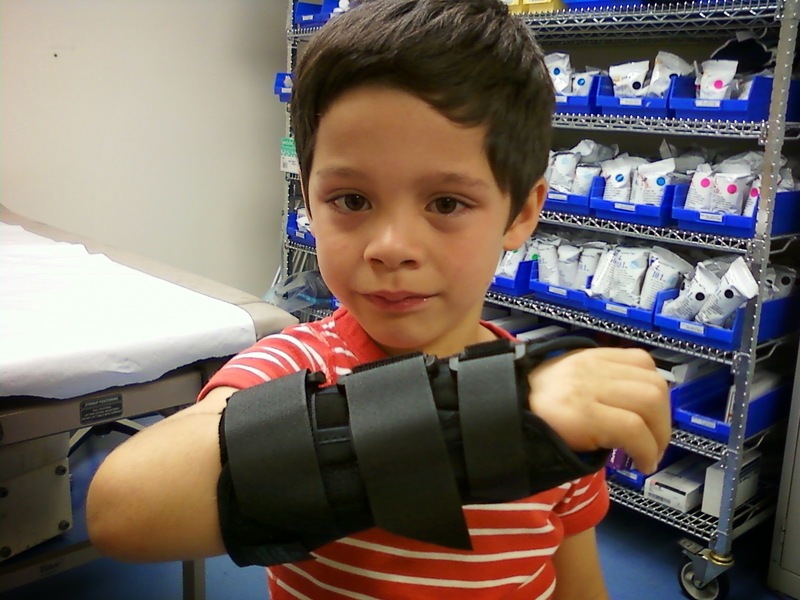 Thank goodness my sons have never had any serious injuries from soccer, but they've had their fair share of minor ones. On the soccer field, they've been kicked in the gut, clipped on the ankle, tripped, had their hands stepped on. Do strengthening exercise to build muscles that protect your bones and ligaments. Play it safe: no headfirst tackles, sliding tackles, or body checks. Don't play through pain. If something hurts, stop. Don't play when you're injured. Aflac, the leading provider of voluntary insurance in the United States and an official partner of the Heisman Trophy, is kicking off the college football season with a new television commercial, an online sweepstakes and a partnership with 1991 Heisman Trophy winner Desmond Howard. Sports and Aflac go hand in hand: the company's voluntary insurance policies can help policyholders cover the unexpected costs that come with a serious illness, injury, or loss. We're not just talking about medical costs (that's what medical insurance is for!). We're talking about other costs that may not be covered by medical insurance, such as broken teeth, lacerations, concussions, ambulance transportation, and ER visits. It doesn't have to be a medical cost, either: cash benefits can be used to pay rent, gas, groceries, and childcare (what if you have to be with your child in the hospital for days and can't get to work?). 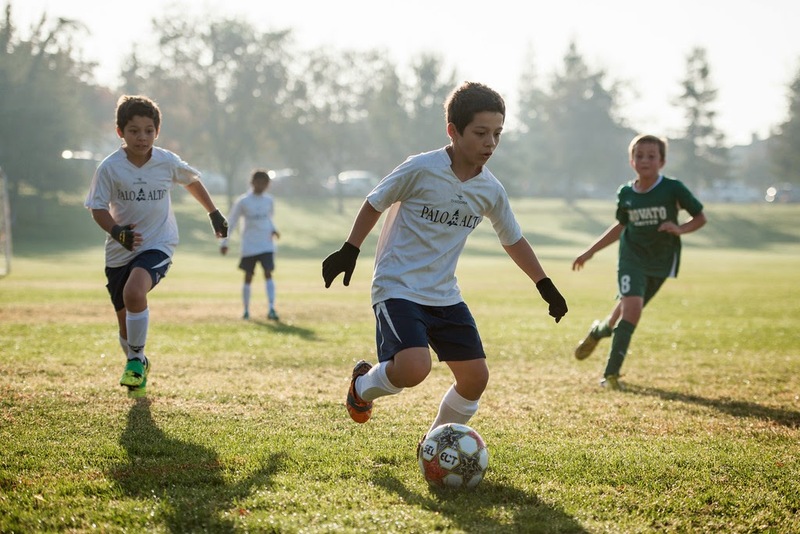 Parents have enough to worry about when their child goes out to play sports. They don't need the extra worry of how to pay for all those expenses (medical and non-medical) associated with an injury. Insurance can give parents peace of mind -- should an accident occur, insurance lets the whole family focus on moving forward and getting better. Enter once per 24 hours on Facebook; for bonus entries, share on Twitter. Enter today and then spread the word to let your friends know it’s #GameOn! It's the season for all things freaky, gross, and scary. Just in time for Halloween, Toys 'R Us has released Monster 500, a line of monster-themed racing characters, vehicles and play sets that pair up two of my boys' favorite things: racing cars and monsters. We had the opportunity to review some items in the collection, and they are just monstrously fun! Kids can start their Monster 500 collection with the 3-inch diecast vehicles. There are 10 Monster 500 Small Vehicles: a clown, vampire, alien, zombie, crocodile, chainsaw madman, werewolf, Frankenstein, Bigfoot, and Dr. Jekyll/Mr. Hyde. The characters and their vehicles are wonderfully detailed, and they're just funny enough to keep them from being truly scary. 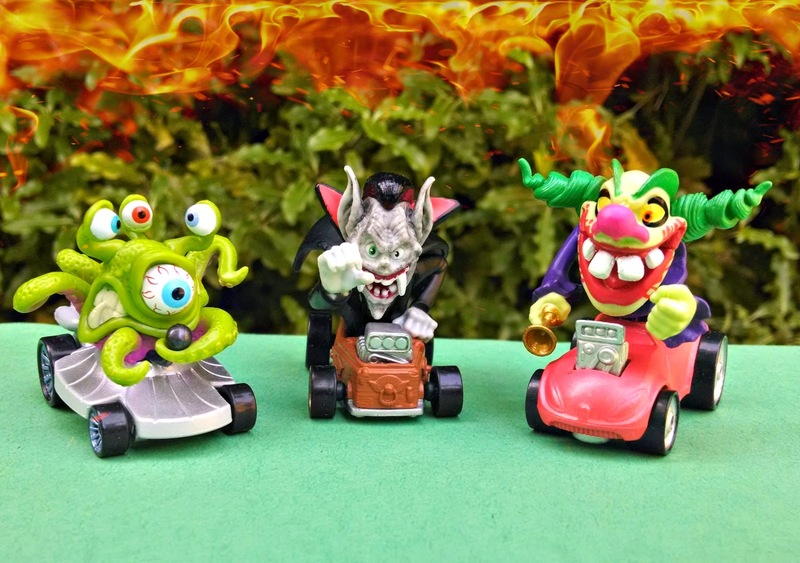 I love their funny racer names, like Dr. Jerkyll & Mr. Ride, Evil Clownevil, and Zoom Zombie! Vehicles are available individually at Toys ‘R’ Us for $4.99 or in the 3-pack for $14.99. Every car comes with a trading card that unlocks a monster car in the FREE Monster 500™ Racing App. The collection also includes racing playsets to keep the monster theme going. The Monster 500™ Toxic Terror Trap Playset (MSRP $34.99) lets kids send their monster racers up a battery powered elevator, then down a spiral racetrack and through a set of doors, in order to topple the toxic green monster -- but watch out for the mutant gator! 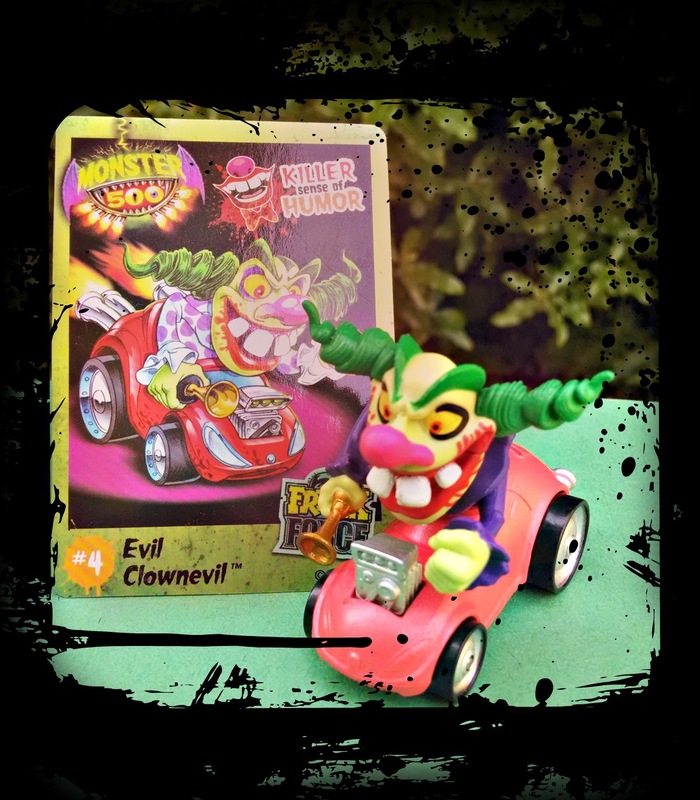 The playset includes the Evil Clownevil vehicle. My kids had so much fun with this playset! It's easy to set up and fun to watch. The toxic monster can be tricky to place in a vertical position, but once you get the hang of it, you won't have a problem. The Graveyard Gauntlet Track Set (MSRP $19.99) is a two-lane race track that you can attach to a tabletop. Press down on the spooky skull to send your race cars down the tracks and see who finishes first! A checkered flag will rise to indicate which lane won. 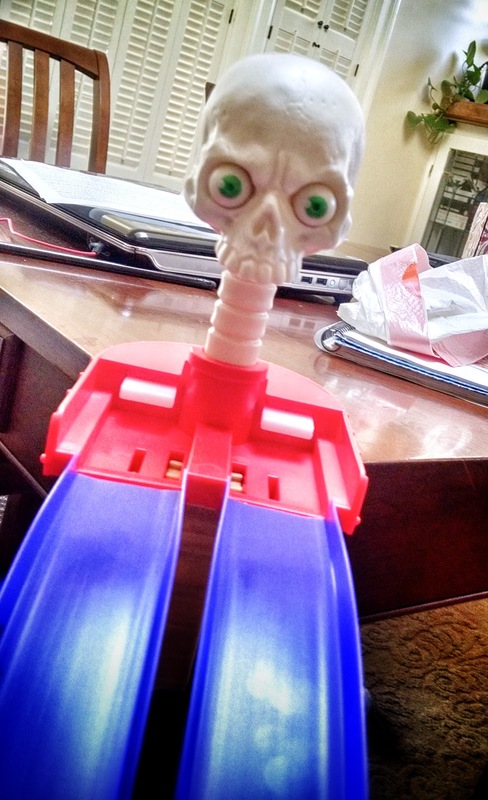 The playset includes the Drac Attack vehicle. Car race playsets are always exciting, and this one is extra-fast because the racetrack starts high and goes all the way down to the floor! I've always regretted quitting piano lessons when I was younger, but at the time, I was fed up. 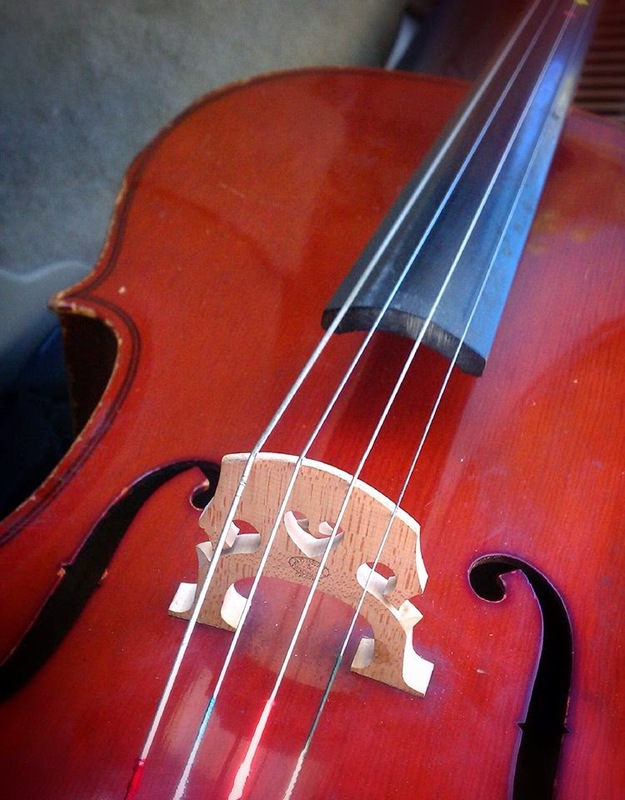 I hated practicing because I wasn't inspired to play any of the pieces I was learning. I never heard any of the songs I loved played on the piano, or on any classical instrument, for that matter. That's why I'm so grateful to The Piano Guys for inspiring my sons and helping them love music. 3Po discovered them a couple of years ago on YouTube, and their covers of popular songs made him want to play the cello. He and Jammy were taking piano lessons at the time, and the Piano Guys' rendition of Vince Guaraldi's Linus and Lucy inspired them to learn the piece on their own! The Piano Guys are a group of four musical artists -- a pianist, a cellist, a songwriter, and a video producer -- that have taken YouTube by storm with their creative videos and their classical arrangements of pop music. Their videos are amazing. My boys love watching the Cello Wars (Star Wars Parody) video, where Steven Sharp Nelson wields a cello bow like a lightsaber. My favorite video is Kung Fu Panda, where Jon Schmidt actually plays a grand piano on the Great Wall of China! The scenery in all their videos are beautiful, but I love watching Jon and Steve's faces as they play. Their love of music shines so clearly. They sound even better than they look. I could listen to their arrangements of Without You, Titanium, Let It Go, The Cello Song, and Home, again and again. I adore the sound of the cello and piano together. Their music lifts my soul. Here's the Wonders track list. My favorites are Don't You Worry Child, Home, Kung Fu Piano, and Let It Go, but every song is great. I can't wait for the day when 3Po (on cello) and Jammy (on piano) can play these pieces for me! New York, NY – What began as an experiment and then exploded into an Internet phenomenon has now evolved into an incredible success story. The Piano Guys, four talented dads from Utah, have climbed the Great Wall of China for their craft, landed atop Billboard charts, sold out tour dates around the world, accrued a massive social media following and scored YouTube viewership at 500 million views. Now on October 7, The Piano Guys will release their fourth studio album entitled Wonders (Portrait/Sony Music Masterworks). Disclosure: I received a sample CD to review. Album info (in italics) was provided by Sony Music. The views and opinions expressed here are my own. It's almost time for the holidays, which means it's time to get out the tablecloth and the fancy china! We love celebrating with family and friends, and this year it's going to be even more fun, thanks to Mom Select and NESCAFE. 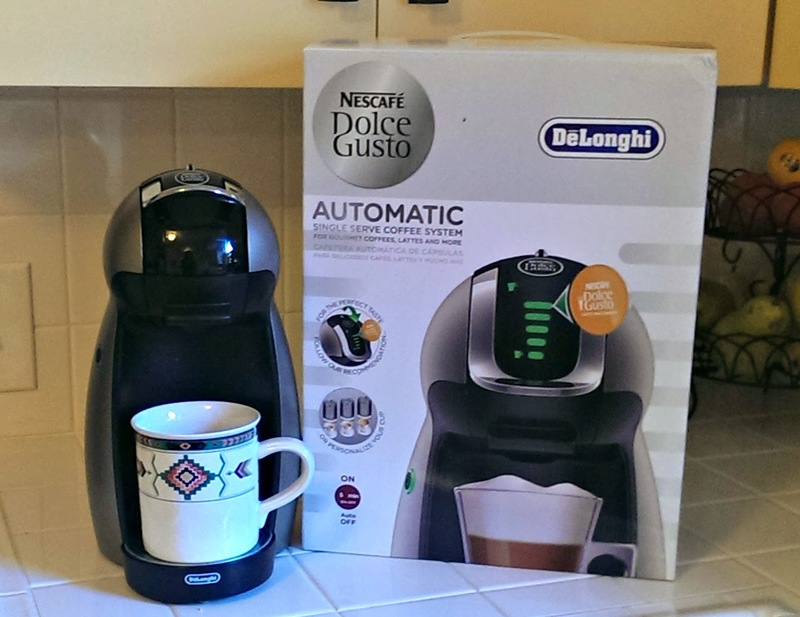 They sent us a NESCAFE Dolce Gusto Genio coffeemaker so we can brew all of our favorite coffeehouse drinks at home! The Genio is a single-serve coffeemaker that uses individual beverage pods, so we can offer our guests their favorite beverages, just how they like it. I absolutely LOVE the NESCAFE Dolce Gusto Genio, and I'm thrilled to be giving one away at the bottom of this post! Owning a NESCAFE Dolce Gusto machine is like having your own personal barista. It's a coffee house quality machine, made by DeLonghi, with a 15-bar pressure system that brings out the deep brewed flavor creates a wonderful froth. You can enjoy a great beverage in under a minute! It doesn't even take up a lot of space like many other machines: it's small and compact and slides right underneath the top cabinets in our kitchen. 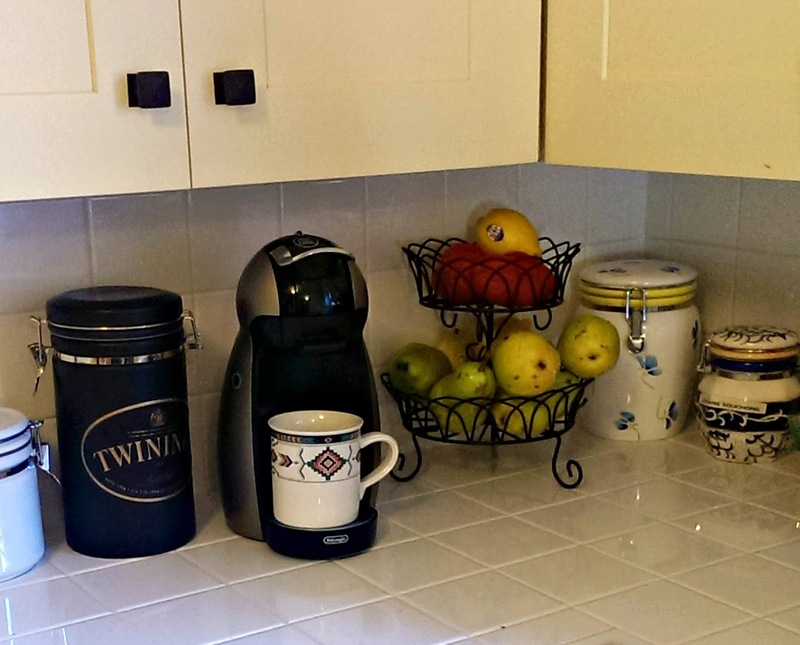 It's so simple, even my kids can make their own hot chocolate or iced tea. Just fill the tank with water, load a capsule into the machine, set the water level (the water level for each drink is clearly indicated on each capsule so you never have to remember! ), and press the hot or cold button. The Dolce Gusto machine does the rest! It takes less than a minute to get the machine ready, and there's virtually no waiting time between cups. It's also so easy to clean -- just rinse the capsule slot and the drip tray. NESCAFE Dolce Gusto has 19 different kinds of beverages, hot and cold! Coffee, tea, and hot chocolate is only the start. Right now we are enjoying Nestea Peach Iced Tea, Chai Tea Latte, Nesquik, Chococcino, and Decaf Grande. We've also tried Caffe Lungo (decaf and regular), Caramel Latte Macchiato, and Decaf Espresso. Everyone in the family has a favorite, and we can offer our guests a huge choice, so they can enjoy what they want. 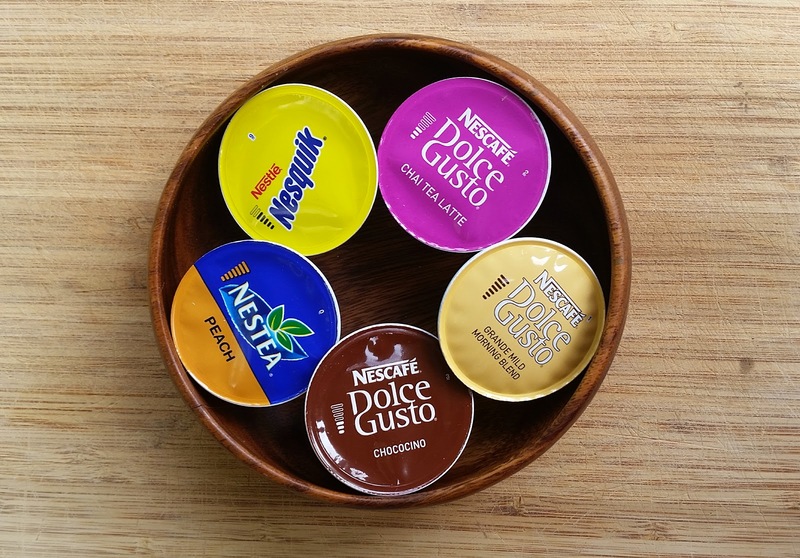 Until this fall, NESCAFE Dolce Gusto pods were not as widely available as other brands. I usually order mine online at Amazon.com or BedBathandBeyond.com (they're also available on Walmart.com and other coffee specialty websites). If I just can't wait for them to be shipped, I would drive to Bed, Bath, and Beyond. However, things are much better now. Dolce Gusto is also available at Sears and select Costco stores in California. Even better, it's available at Target.com as well as select Target stores in California! I'm so lucky I live in California!! For more updates on Dolce Gusto availability, follow Dolce Gusto on Twitter and Facebook. One lucky Bonggamom Finds reader will win a NESCAFE Dolce Gusto Genio coffeemaker! This giveaway ends at 11:59 PST on October 28, 2014. I will draw a winner at random on October 29 and post their name after they confirm acceptance. Continental US residents only. For additional giveaway rules, click here. Disclosure: I participated in an Influencer Activation on behalf of Mom Central for NESCAFE Dolce Gusto, and received a promotional item to thank me for my participation. Giveaway prize is provided by NESCAFE Dolce Gusto via Mom Central. The views and opinions expressed here are my own.